Mantras are words or phrases that are chanted out loud or internally as objects of meditation. Often these mantras are associated with particular Buddhist figures, whose qualities can be cultivated by the repetition of the relevant mantra. Mantra meditation predates Buddhism, probably by hundreds of years. The origins of mantras go back at least to the Vedic tradition that preceded the Buddha, where mantras were used as incantations to influence, or even to control, the gods. In this section of our site, you can explore how we define mantra meditation, learn how mantra meditation works, and read about the various figures that mantras are associated with and what their mantras mean. Throughout history, cultures have believed in the sacred power of words. They have believed that uttering certain words or names could control the external world, or control the unseen forces, like gods or spirits, that they believed acted upon the world. We can see that in the English word “spell”, which can mean simply to put letters together to make words, or to use words in order to control the world through magic. The words grammar and glamour have the same original meanings. Gramma-techne was the Greek term for the science or art of letters. This came into English as the word grammar, but also came in Scots (as “glammer”) to mean “to cast a spell upon” — to employ the science and art of letter magically in order to enchant. The word glammer was anglicized as glamour, and came to have its more contemporary romantic and aesthetic associations, where someone is able to influence us, not by the power of their words, but by the beauty of their appearance. So the English language contains fossilized notions that words can have magical powers. This belief is the power of language was particularly strong when it came to the words that we call names. In ancient India it was believed that if you knew the true names of the gods, then you could call upon them and compel them to do your bidding. Tantra made extensive use of mantras as ways of communing with and influencing the gods, and Buddhism co-opted this methodology as a way of getting in touch with the qualities of enlightenment. The Mahayana had already developed a “pantheon” of symbolical figures in human form to represent the diversity of the enlightened state. Given the close contact with the Tantric traditions, it was natural that these archetypal Buddhas and Bodhisattvas came to be associated with particular syllables and mantras. It was believed that if you knew the true names of the gods, then you could call upon them and compel them to do your bidding. Mantras are found in the Japanese Buddhist Nichiren tradition, where the recitation of Nam MyÃ…ÂhÃ…Â Renge KyÃ…Â (Hommage to the White Lotus Sutra) is the main practice, and in the Japanese Shingon tradition. In the Japanese Pure Land tradition, the mantra Namu Amida Butsu (Homage to Amitabha Buddha) is a key practice. Variations of this mantra are found in Vietnam, Korea, and China. Strictly speaking, there are no mantras in the Buddhist Theravadin tradition, although there is much chanting. Chants of lovingkindness, such as Sabbe Satta Sukhi Hontu (may all beings be happy), and chants of protection and blessing are very common, and these function as mindfulness practices in exactly the same way as actual mantras. I’m not aware of any CDs with that chant on them, although Sunada and I have been talking about doing a mantra CD. She’s a trained singer so at least some of it (i.e. the bits she does) should be worth listening to! In chanting names of bodhisatta, using rosary for mediation, do we have to recite the transferrance of merits at the end of the session. I understand any humble/noble buddhist act be transferred for better catalyst results. Kindly advice. There aren’t many “have to’s” in Buddhism — it’s really up to us what which practices we want to undertake. But I’d wholeheartedly encourage anyone to consider transferring the merit not just of mantra practice but of any formal practice whatsoever. For those not in the know, transferring or dedicating merit means that at the end of the practice you reflect that you’re not doing this as a selfish act purely to benefit yourself, but you’re hoping that whatever benefits you’ve gained as a result of the practice (any wisdom, compassion, or peace that you’ve found) will help others as well. Thats an excellent few verses from Shantideva i must say! May i ask which particular script/book/etc it came from so i can look at the full text/extrapolation? The verses are from (wait for it) the Bodhisattvacaryavatara, also known as the Bodhicaryavatara, which translates as “The Guide to the Bodisattva’s Way of Life.” There are good translations by Stephen Batchelor, Kate Crosby & Andrew Skilton, and the Padmakara Translation Group. There’s also a version online. The lines quoted above are verses 6, 10, 20, and 21 from a much more extended transference of merits in Chapter III. The whole of chapters II and III of the Bodhicaryavatara constitute a devotional ritual called the sevenfold puja. Hi Bodhipaksa. Finally got around to reading your update of this page. It reads much better than before! I particularly like the grammar/glamour link! The two words are seldom used together in a sentence, if ever. Good work as always. Love Jayarava. Thanks for your kind comments, Jayarava. Did you take a look at the page on How Mantra Meditation Works? I took account of some of the shortcomings you pointed out in an email and made substantial changes. I’d be interested in your thoughts. I got this mantra in from my Korean teacher and maybe the pronunciation was in korean where k some times is g.
whats a good short mantra i can use for school and whats the meaning of it? I’m afraid that’s too general a question for me to answer. Feel free to be more specific about what your needs are. Have just come back from a Tara retreat and was interested to see that the ‘tune’ of the Tara mantra on the retreat was different to the one you chant here. Is it common that the mantras are chanted to different tunes? A friend has also told me that on a retreat she went to, the Tara mantra was sung in harmony. Yes, there are lots of different tunes that one mantra can be chanted to. The way that the Avalokiteshvara mantra, for example, was chanted in the FWBO changed because with the “old” way it tended to lack energy and turn into a dirge. We now use a tune that (as far as I know) has a Tibetan origin — at least I heard it being used in the soundtrack of a Tibetan movie. I’ve heard a few different versions of tunes for the Tara mantra, and I wish I could hear the one you were doing. Can you hum it for me? Seriously, if you phone our Skype number you can leave a message with the mantra on it. The number’s +1-603-292-3960. I’d love to hear from you! Awesome! I’m looking forward to checking the voicemail instead of loathing the task, as I usually do. Worked like a charm! Very nice mantra, thanks! Traditionally, the Manjusri mantra (om arapacanadhih) is said to help with learning and memorization generally, but whether it actually does this is something I don’t know. Good luck! I found that when doing a Chant or Mantra in a low vocal, so that there is a deep vibration of the bass tone of the vocal chords…..
anyways.. I came up with this because of the 7 Chakras and how to awaken them. please try and see what you think.. I have found strange sensations as I Chant.. I just got to know about the Usnisa Vijaya Dharani Mantra. I somehow feel attracted to it and want to chant it. The information given about the mantra states that a proper method has to be followed in order to chant the mantra. I.e., one has to created a square mandala, place flowers and variety of grass on it, burn incense sticks and then recite the mantra. I would like to know is it important to do the above in order to learn and recite the mantra? Can we not just chant it? Pls help. I’m quite sure that chanting the mantra without the creation of a mandala and the making of offerings will have a beneficial effect. 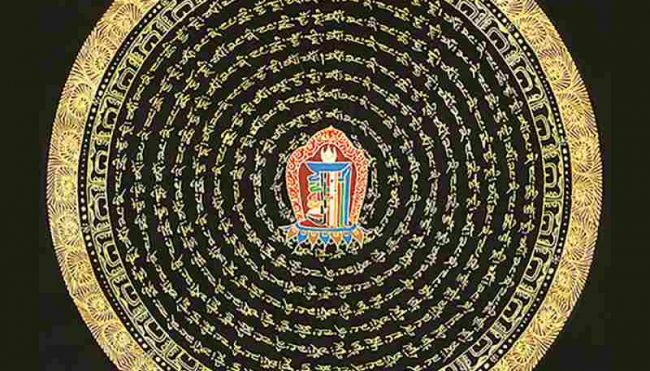 At the same time, physical and mental, as well as verbal, engagement will deepen the effect of the practice, assuming that the physical acts of mandala-creation and the making of offerings are done mindfully and with reverence, so any aspect of that that you can bring into your practice will be beneficial. Where possible, I’d suggest doing the mantra in front of an image of Ushnisha Vijaya, bowing, making offerings and lighting incense. There needs to be as much as possible an attitude of gratitude and of openness to the deity. I would like to ask a question, if I may. In my practice I often listen to suttas and teachings in the meditation mode. (Way of the Bodhisattva); less for individual suttas (16 minutes for Dhammacakkappavattana Sutta). Do you think this “qualifies” as a form of mantra meditation? I think what you’re doing is great, and very meditative. I wouldn’t describe it as a form of mantra meditation, however. With mantras, the meditator is generating the sound, either internally or out loud, whereas you’re just listening to the sound. Also, mantras tend to be generally more evocative, symbolic, and non-conceptual — more right-brain, if you will — while sutras tend to be more left-brained. Of course one can recite sutras, and you can involve your right brain in listening to or chanting sutras (and some mantras, like the Vajrasattva mantra, are more conceptual), so the distinction between the two isn’t absolute, but what you describe isn’t what I’d think of as mantra meditation. That doesn’t mean it’s any better or worse than mantra meditation — just different. I’m curious why you asked, actually! As an autodidact of sorts, I was only looking for a more informed perspective on the question. From that perspective, I very much appreciate the answer you have given. It was very helpful. It also provides me with some sound ideas for varying the practice. that “can I visualise the meaning of my mantra or I should just concentrate on the words of mantra”…thanking you sir. Why not try both and see what happens, Rishi? Different things work for different people. sir I have been practising mantra meditation for last 3 months.in the begining I felt a relief whenever I used to do meditiation..but sir now from last 15-20 days I am not experiecing that peace which I felt earliar…instead of that now a days there is flow of many thoughts which makes irritated..what should I do to maitain my meditation….I loosing my concentration as well…thanking you sir. Hello, Rishi. Sometimes the mind finds ways past our meditation practice in order to express restlessness. We become habituated to the meditation practice and start to do it on “autopilot.” Because we’re not fully engaged with the meditation practice, the opportunity arises for other activities to take place in the mind. I see the problem as being a bandwidth one. Bear with me and I’ll explain. I’m sure you’ve had the experience that when you’re uploading or downloading a file on a computer, it’s very difficult to do anything else online, because there’s not enough bandwidth available. So you’ll be trying to connect to a web page and it’s happening very slowly, because the computer’s connection with the world is already in use. I think meditation works in a similar way. The mind has a limited bandwidth, and if we’re paying full attention to a mantra (or any other object of concentration) there’s simply no bandwidth left for distractions. So the amount of distracting thought decreases. We’re fully attentive to the object of the meditation, and the mind becomes calmer. But what happens when we pay less attention to the mantra, perhaps because we’ve become so used to doing the meditation that it’s an automatic action — one we can do without needing to be mindful of our actions? Bandwidth has been freed up, and so other activities can take place in the mind. In other words we experience distraction. So what do we do to deal with this situation? We need to increase the “download rate” of the mantra so that there’s less bandwidth available for our distractions. Assuming you’re chanting out loud, you can do this by paying much more conscious attention to the body, and especially to the movements of the lips, tongue, and the breathing (including the diaphragm). If you’re repeating the mantra internally, then I’d suggest “hearing” more than one voice. You could imagine that the mantra is being chanted by a choir of devas, for example. Or you could introduce more visualization, so that you’re in effect downloading video rather than audio — and as we know, video requires more bandwidth. In other forms of meditation, we can be more aware of the sensations from the outside world, or sensation in the body, for example. This has the same effect of using up the brain’s “bandwidth” so that there’s simply no opportunity for distracting thoughts to arise. sir thanks for your reply,I have a doubt……its been said that a relaxed and effortless meditation produces more effective results.so if I apply visualisation[ I m already poor in visualisation] or any conscious effort in my meditation then how can I go to a deeper level of meditation because regarding mantra meditation I have read that only a natural and relaxed meditation is effective….so sir without any conscious effort how can I gain my concentration as I asked in my previous question…thanking you sir. You’re correct that a relaxed and effortless meditation is the most effective. Visualizing need not be effortful at all, at least in the sense of conscious effort. The conscious mind does not generate imagery — it simply makes the request, and the unconscious mind supplies the visualization. If you consciously try to “make” an image in your mind, you’ll find that it either doesn’t work at all and you just see the inside of your eyelids, or you’ll produce a very fuzzy image. If you just relax and allow imagery to appear, however, it will be crisp, clear, and effortless. thanks sir for taking out your precious time for me,…I wana ask just one more thing that during the time of meditation should I try to understand the meaning of the mantra or I should just repeat the mantra as it is…..sir for last 8-10 days I m having a strain at the back of my neck and some problem in my throat. is it due to the meditation detoxing process or its just the fanatsy of my mind…..thanks a lot sir…..now I’ll not take your much time..thanks. I’m not quite sure what your question means. If you don’t already understand the words of the mantra, then I don’t think you should try to understand the meaning of the mantra as you’re chanting it. I’d suggest you reflect on the meaning outside of your practice, so that the chanting evokes the meaning naturally, without your having to split your attention by both chanting and thinking about the meaning of the chanting. But if you understand the words of the mantra, then of course by all means chant and be aware of the meaning of what you’re chanting. I’m afraid I’d just be guessing about the tension and the problem in your throat. I tend to go for the simplest explanations first, such as emotional strain, problems with your posture, or, in the case of our throat, an allergy or infection. What is the symbol on this page? I have a necklace with the same symbol, I think but couldn’t find the meaning……….THANKS! It’s the symbol for OM, Laurie. Bodhipaksa, is P&amacr;li similar in pronunciation to Sanskrit? I was just wondering because of the dhi in siddhi, shouldn’t that be like a forced breath out during a di pronunciation because it is aspirated? Thanks in advance. By the way, I miss being able to donate. Yes, the pronunciation generally follows the same rules, and you’re correct: the dhi in sid-dhi should be aspirated. So should the dha in Bud-dha, but of course it sounds pretentious doing this in a normal conversation! Sometimes you have to save proper pronunciation for special occasions! Was this mantra meant for me? Should I use it or just pay no attention to it? Does such a mantra exist? I’m not aware of that as a mantra. Sometimes certain people do hear things during meditation. This has happened to me several times, and none of the things I’ve heard have been at all significant. I regard these things as being tricks of the mind, and so I wouldn’t suggest paying much attention to it. I’d guess that your mind, in an almost dream-like way, has thrown up something that sounds like a mantra, and I doubt if it has much significance. These kinds of auditory hallucinations, in my experience, tend to arise when we’re beginning to develop a greater degree of concentration, and so I’d take it as generally a good sign that your practice is moving in the right direction. I’m sorry, a failure on my part.I’ll rephrase. It was when I started meditation 18 years ago that I heard this mantra while making a drink for myself in the kitchen. I somehow still remember it to this day, word for word of it. May the Buddhas be with you. Thanks for the clarification. I don’t think the fact that you weren’t meditating at the time you heard this mantra makes any significant difference. Meditative states where the mind is more open to dream-like communication from the unconscious take place outside of formal meditation as well. I’d suspect that the fact that you’d recently taken up meditation was significant, however. Thank you again.The dream like communication from the unconscious can take place outside of formal meditation.That is interesting.Last month, a green light appeared on the ceiling of my room in the wee hours of the morning.My wife saw it first and woke me up.Then the green light turned into the white lion face of Senge Dongma.Only the face and the white mane, which was being gently blown around in the gentle breeze,were visible.The face enlarged to the size of my bed and started moving down towards us until it was only about a foot above us.My wife, a Christian was stiff scared while I was chanting in my heart.The face then moved back upwards towards the ceiling and slowly disappeared. I have never chanted her mantra before.What is the reason for such appearances or should I say holy appearances? What is the best thing to do in such situations? I have no explanation for what you saw, I’m afraid. I’m not much of a believer in miracles, but if what you saw is meaningful to you, I’d suggest dwelling on images of Senge Dongma, and learning more about her. We can develop a fascinating with these archetypal figures that is akin to falling in love, and that helps us to appreciate the qualities of the figure in ourselves. It’s important to recognize that ultimately the Buddhas and Bodhisattvas are not separate from ourselves, and that when we’re paying attention to them as “external” object we’re also paying attention to the qualities they represent within ourselves. Thank you sir.Your comments are full of wisdom.Even with no explanation for what I have seen, your advice gives me all the more reasons to keep me going on the path.Very very few people can give such advice.Many others have just brushed me aside. I am new to meditation and to Buddhaism. I would very much appreciate it if you could guide me to some mantras that would bring me openmindness and peace. I’d suggest clicking on the link to the left that says Buddhist Mantras and then checking out some of the mantras we cover. There are audio version for you to listen to and some text about each mantra. Find which ones work for you. I have tried several mantras and found them to be very powerful. The problem is I stopped and went downhill fast. I feel a distinct lack of balance overall. What meditation or practice would you suggest to help regain a sense of balance. I don’t advise people to use mantras as a sole method of meditation. Obviously people have different temperaments, but I find mantras best for adding to an existing practice, which I think is ideally based on mindfulness of breathing and lovingkindness meditation. Those are the two meditations I’d encourage you to take up as a regular practice. Thank you very much for the advice. I will give it a go. I have looked through the two practices you recommended which has helped me realize what was missing. I can now see for the first time,with clarity, what is needed to find the balance I so desperately need. Do you happen to know the chant that Tina Turner said when she first started to study Buddism. I had heard it before and then in her life story movie. Thank you! That is it. Sir, I would like to take up the study of Buddhism, but as a complete “beginner”, I don’t know where to start. I have had some sad things happen in my life. I have brought myself back from a dark place, but although I have strived to improve my life and myself (and I have, ostensibly), I still have a spiritual need I wish to fulfill, to find peace and let go of my troubles of the past. I feel I need the discipline to focus myself, and once again be motivated. I wish to feel that I no longer lost or just drifting. Please advise. You might want to start by finding a practice group that suits you. It really is ideal to practice with others, although it has to be a group and practice that you find works for you. If that’s not possible, I’d suggest taking up first mindfulness of breathing meditation, and then lovingkindness meditation. These are both important, and even indispensable, practices. Hi…I would like to ask a couple of questions please…firstly I would like to know if the buddhist mantra namyo renge kyo can be chanted for getting a job if one is going through financial difficulties..can one chant it for material gains? Secondly, can reciting/listening of Usnisa Vijaya Dharani Mantra help one to reduce his pain, suffering and bad Karma if one is going through a tough time. I know that the Soka Gakkai people tend to chant Nam Myoho Renge Kyo for material benefit, but this isn’t, to the best of my knowledge, a practice that would be looked upon very favorably. I’m not a fan of this approach to practice. If you want material gains, do what’s needed to create material gains — in your case applying for jobs, networking, etc. Do make sure that you meditate, since this will help you to be in a more positive and relaxed frame of mind, which will boost your creativity and make you the kind of person people want to employ. By contrast, I think chanting a mantra, hoping that it will bring material benefits, could give you that “desperate” feel that turns people off. For your second point, chanting any mantra will tend to reduce your suffering. The mantra replaces any negative thinking you might otherwise have been doing, and so helps your emotions to settle down, and your mind to clear. But lovingkindness and mindfulness practice would be very useful as well. I believe those practices to be more deeply transformative than mantra practice alone. Thirdly, there are different kinds of emotional strength. A mantra like that of Padmasambhava or Vajrapani invokes a vigorous form of emotional courage, while any of the more “gentle” mantras, like Tara or Avalokiteshvara, calls forth the courage of compassionate patience. Hi, i just found your page; very informative. i am a Caribbean living in New York, and i have fallen in love with mantras i have found on YouTube. This is all new to me, but i feel i have found my spiritual path. Could you recommend some mantras; i understand that specific needs or situations have specific words/mantras….how do i start? I mean, i like most of what i have listened to, but not always the meaning is translated to English, or Spanish. I will greatly appreciate if you email me some info. Thanks for your interest in mantras. We have plenty of information on mantras on this site, and that’s where I’d suggest you get started. We’re not really in a position to email detailed guidance on mantra practice to individuals on request. i dont have a clue what the word mean but i love it! Do you think Deval Premal’s mantra’s could be used to meditate by saying the mantra as she does? Does mantra meditation work ‘better’ than just attending to one’s breathing? I think anything you say or chant can be used as a mindfulness tool. When my kids were younger and I had to sing a nursery rhyme to them over and over I’d become aware of the movements of my lips and tongue, and of the breathing. Of course the content wasn’t very spiritual (“See-saw, Marjorie Daw…”). In terms of effectiveness, I think mantra meditation is more limited. Because there’s activity in the mind, it’s not possible to gain the same depth of calmness that we can achieve in mindfulness of breathing. But mantras do calm the mind by reducing inner chatter, and that’s helpful. They’re esthetically pleasing, and they involve contemplation of spiritual ideals. That’s all good stuff, and not a significant factor in mindfulness of breathing. In other words they’re very different practices, and do different things. A little off base but was wondering. Is buddhism as you understand it devoid of God? Is there no central God figure or supreme being that guides and manages and overrules? I’d be troubled if that were so. Thank you again for your wonderful site. God and gods do not play a role in Buddhism. The Buddha is recorded as having talked about gods, but those gods are simply beings like us, who are born and die but on a different timescale. They’re not awakened, and thus are spiritually inferior to the Buddha and anyone else who has attained bodhi. They didn’t create the universe. Our destinies are seen as being controlled through our own actions, or karma, leading in a natural way to painful or non-painful consequences, without the involvement of any kind of external entity. I don’t think the Buddha believed in the literal existence of these gods, by the way. In the discourses where he’s recorded as talking about them he’s frequently in satirical mode. For example he talks about one of these gods being so deluded and egotistical that he believes he created the world. I understand that for some people the non-existence of a God is a threat, because God has been invested with ideas such as being the source of morality, but in Buddhism our source of morality comes from an awareness that living mindfully and compassionately is the only way we can feel complete and fulfilled, and that this completeness and fulfillment can only grow to completion through radical selflessness. I have met a women who has MS who was bedridden then she started meditation, now she is walking with walking stick! I have MS and is wheelchair bound – what chant must I do? How do you suggest breathing during meditation, I’ve found that steady disciplined attention to rhythmic diaphragmatic breathing and following the rise and fall of the abdomen to be as useful as following my breath in and out through the nostrils. Any thoughts? Ive heard even that regular breathing exercises thus is by itself healing. These days I find that the more I pay attention to, the better. Noticing the rhythm of the diaphragm is good, as is noticing all of the movements of the ribcage at the same time — front, sides, and back. In fact combining this with an awareness of air flowing through the passageways can be very powerful. At least that’s how I start. By the end of the meditation I may be focusing just on the nostrils. I’d suggest starting with mindfulness meditation. What happens to help people get over physical difficulties is not something magical. It’s simply that they learn to relate more healthily to their pain and disability. Hi Bodhipaksa i was curious if you could point me to the right direction for a stress relieving mantra, i have a lot of stress and anxiety unfortunately that is really bothering me. Mantras can definitely help with stress. The chanting (or mental repetition) of the mantra can be soothing, and it also reduces the mind’s capacity for keeping up a train of stress-inducing thoughts. Probably any gentle mantra would be helpful. If you have any anger along with your stress then Sabbe satta sukhi hontu would be good. But the Avalokiteshvara mantra, Om mani padme hum is also calming. 10 Ways To De-stress And Be Happy! I just discovered your page… What a great resource of info! I have just started taking crystal healing classes, and we are practicing Mantras, Tuning, and several other ways to meditate. I am feeling a sense of peace and love that I have never felt before…and I love it! I have been dedicated to doing my 40 day mantra, and am on day 17, but am currently on a mini vacation, and I forgot to do my chants yesterday. I doubled up on them today…will that affect the outcome of my intentions? Or will today start my 40 days back to Day 1? Or does it not matter since the intentions are still there? I think it’s best to think of these things as being like building muscle. If you miss a day in the gym, you don’t lose all the progress you made previously. You did lose an opportunity, but at least you got straight back to your practice again. do you believe in the power of nam myoho renge kyo? I chanted for 3 yrs but I struggled with the fact that the mantra did anything. I also felt like the nichiren buddhists all spoke like robots when you challenged them. They all had a standard answer for my questions. SO I stopped, but am still wondering…. I’d consider nam myoho renge kyo to be no different from any other mantra, and not as having the special powers that the Nichirens ascribe to it. I’m very wary of that particular tradition, since it says it’s the only true form of Buddhism. I just wanted to thank you for this article, and your response to another user back on 4/17/11 about fascination with deities akin to falling in love which hit very close to my heart. I’m coming to Buddhism from neo paganism, and I’ve struggled greatly with feeling like I’m abandoning different deities as I’ve grown as a person. Your advice in thinking of my desire for a closeness with them as representational of the qualities within myself or ones I’d like to cultivate has been extremely liberating for me, and has allowed me to let go of not only guilt, but attachment and dependence. Your site is wonderful. Thanks again for sharing your wisdom. What is the insight at the heart of the Heart Sutra – the insight that takes us to the other shore? It’s the insight that all things are empty of inherent (separate, permanent, definable) existence, and that there is nothing to hold onto and no one to do any holding. And that having seen this, compassion arises for those who haven’t. I am interested in meditation. but some of he obstacles stops me to concentrate. Please guide me. I’m afraid I can’t really offer individual meditation coaching here, Prasad. Please do browse the site, though. There’s lots of guidance about meditation here.